Yes Folks.....Another Die Box! But it's a great prop and some very funny routines can be used from what I've read on the Boxes Tubes and Bags sub forum. Anyway using plans from the Magic Nook (but altered somewhat), it works on the T**** S**** S**** principle. The Box itself was constructed from 10mm Pine which I thicknessed with a Makita Thicknesser. The base is a bit thicker, about 15mm. 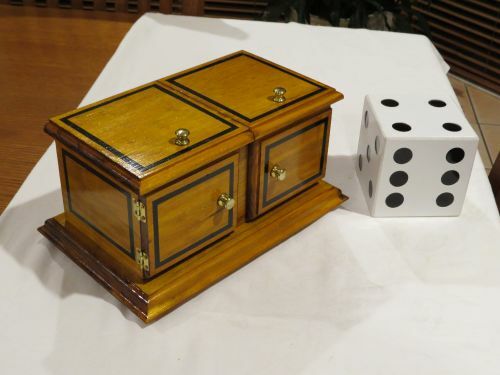 It was stained with a Golden Teak stain and the brass hinges, knobs and feet were supplied an Australian company that specialises in these sorts of thing. The black lining was just masked and sprayed on then clear glossed over. I am still waiting on some metal enamelled dice pins that I may or not apply to the box. The Dice itself (95mm x 95mm) was constructed from 3mm MDF and the pips were recessed with a Forstner bit and 20 thou styrene discs were glued into the recesses. I thought this would make repainting the dice that bit easier,if it ever needs to be. It was a lot of fun constructing this prop. I just have to think about what I am going to have a go at next. Salty Dog: are you going to add the "Combo" box part, where the die reappears after vanishing from the die box? Thank You Mroek and Jim for your very kind words. I was going to use a hat originally, but my Fedora is not big enough! So we went and bought a suitably sized gift bag to use as it's normal "place of residence" and use the box to smuggle the dice into a gambling venue. I would love to get a Las Vegas themed gift bag so I might have to put a request on the forum. I will have a deeper look into the Combo Box part, it is a good idea. Ask the magic genii - your computer.